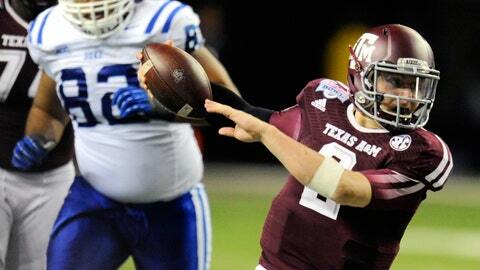 If it was the last time we saw Johnny Football at Texas A&M, he put on a show we’ll never forget. Manziel’s Heisman moment his freshman season was an unbelievable touchdown pass in the upset of No. 1 Alabama. He may have topped that in the Chick-fil-A Bowl against Duke on Tuesday. Trailing 38-17, Manziel began the Aggies’ second half rally with a jaw-dropping maneuver to find his open man near the sideline for a touchdown. The sparked Texas A&M’s wild come-from-behind 52-48 win. Love him or hate him, Johnny Football always knows how to put on an exciting show.